Enter the Colosseum and stand alongside gladiators of the online slots world. Risk your life in front of thousands and work your way through the ranks of Ancient Rome. Rewrite history as you work through the bonus rounds and feel the crowd’s anticipation intensify as you begin your fight for cash. Check out these slot games when you look for the best gaming experience! NextGen has been delivering innovative and creative online slot games for almost two decades. The energetic development team knows how to provide extraordinary entertainment and quality video slots. NextGen Gaming is one of the leading developers in this market and has proven themselves to be very popular. They also offer a big collection of games with a variety of different themes that appeals to a wide audience. Call of the Colosseum is all about the ancient Roman Empire and the legendary fights that used to take place in the impressive structure of the Colosseum. Its unique theme of medieval times was recognized and acknowledged as one of the best UK slot online. You can see the 5 reels and 3 rows between two ornamented columns on each side and under a sculpted edifice, bringing you right back to the time of the Roman emperors. The art style is nothing extraordinary but it fits the theme fine. You will find iconic symbols for the Roman Empire on the reels: grapes, coins, leather sandals, a bag of coins, a warrior's shield and helmet, a chariot, the Colosseum, a dangerous looking tiger and a sultry female. Look out for the emperor, he is the wild symbol and can land on reels two, three or four. If you land a scarred shield then you will have found the scatter. Get three or more of the scatter on any position of the reels and you will be rewarded by free spins. Initially, you will get 10 free spins and all your wins will be doubled during this period, but you can easily increase the number of free spins making this feature very lucrative. Every time you land the emperor symbol during free spins he will either show you a thumbs up or a thumbs down if he shows you the thumbs up then you will be rewarded another one to three extra spins. This way you can extend the number of free spins massively. You can also activate the Gamble feature by clicking the “Gamble” button underneath the reels after a win to get the chance to double or quadruple your win. You just have to pick the right card colour or suit of a card drawn. So why not take a time travel back to this empire and discover the 25 paylines this online slot offers. To start your journey you can bet just one penny or if you consider yourself somewhat of a high roller and want to get the most out of all these free spins up to £125. 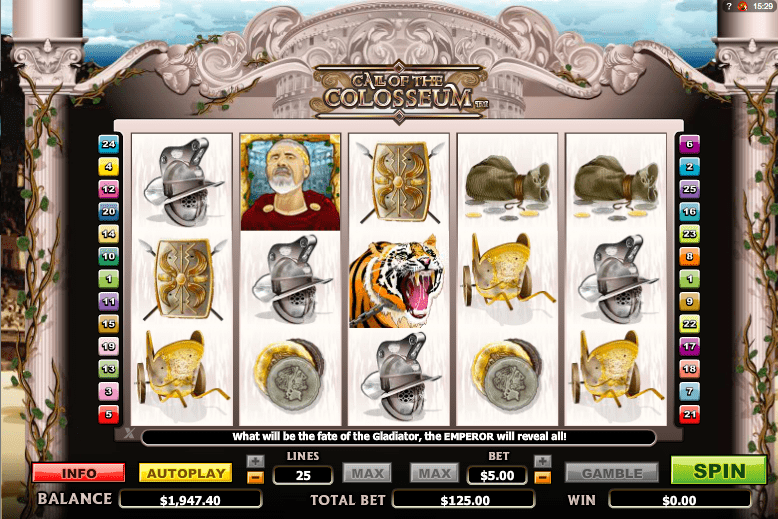 Call of the Colosseum is a basic video slot which allows you to easily immerse into its gameplay. If you are new to slot games then this game will be a good choice to start with. But even as a slot game veteran you will still enjoy this video slot and love all the free spins that are possible to win. Call of the Colosseum will take you back to ancient Rome and will let you take part in the epic battles of the past. A similar game is our temple of isis slot.